Why not book a demo to see for yourself how DocuWare can capture and manageall of your documents regardless of their format or origin. 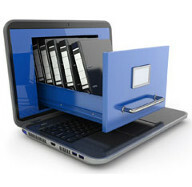 PC generated documents, accounting documents, faxes, e-mails, scanned or imported documents, all of these can be easily indexed, stored and quickly retrieved. Do you already have proprietary software packages? No problem - integration with all packages can be enabled via DocuWare’s simple and easy to use interfaces. You can be confident that TBSL will work with you to identify and install the right package for your business; ensure full integration with all your existing software; providing a high level of on going support following the initial structured training and implementation. Once all your documents have been transferred to DocuWare, we can even provide you with a range of shredders to safely and securely dispose of all that extraneous paper! Can’t bring yourself to shred all your documents? We can arrange secure, off-site storage to free up valuable office space too. Why not give us a call now on 01522 888580 to discuss how TBSL could help your business be more efficient? Or alternatively, fill out our enquiry form and we’ll get back to you.